In the wake of the recent riots, much attention has been given to the causes of the riots but an issue now at the forefront of press and public concern is the level of punishment being meted out to those convicted of riot-related offences. Reports of first offenders being convicted and imprisoned for thefts of items of small value have raised questions about the purposes of sentencing, the problems of giving exemplary sentences and of inconsistency, as well as the issue of political pressure on sentencers. The government has been emphasising the need for harsh punishment for riot-related offences and this has been reflected in some very severe sentences for offenders with no previous convictions, including young offenders, and where offenders have pleaded guilty. The spate of harsh sentences raises concerns over the consistency of sentencing between offenders convicted of theft and handling within and outside the context of the riots and between offenders sentenced for similar crimes in different courts. The Criminal Justice Act 2003 stipulates five purposes of sentencing including punishment, crime reduction, reform and rehabilitation of offenders, public protection and making of reparation by offenders to those affected by their offences. Clearly the primary focus in sentencing those involved in the riots has been punishment but on the desert theory of punishment, which underpins the relevant sentencing provisions in the Act, the key principles are to treat offenders convicted of similar crimes with similar punishments and to ensure that punishment satisfies the principle of proportionality. The custody rate, that is, the percentage of defendants convicted who are given a custodial sentence, is much higher than normal for riot-related crimes and the sentences themselves are also in many cases longer than usual. There has also been in increase in the numbers being remanded in custody awaiting trial, even though the outcome at trial may be a noncustodial sentence. The effect of this disparate response is damaging to the legitimacy of the criminal justice system but is also short sighted. If we unpick the reasoning behind the spate of exemplary sentences they are designed as (not so short) sharp shocks to deter offenders from future rioting and expressing public displeasure. Yet we know from research on deterrence that short prison sentences have limited effect in preventing reoffending and half of those released from prison will reoffend within one year and the reoffending rates are much higher for younger offenders. The effect on young people of carrying a criminal record is also likely to be counter-productive in terms of access to employment. Serious offences such as arson will inevitably attract harsh sentences, but what has been most marked is the severity of sentence at the lower end of the seriousness scale. For the victims of theft and criminal damage, the prime concern will be compensation and restitution for their losses and victims are not necessarily more punitive than others. They may also wish to confront the perpetrator to express the impact of the crime A community punishment which focuses on offenders paying back to the community, could be more effective in some cases, then simply containing them in prison. If the rationale is to satisfy public opinion, this is a very dangerous route as catering to public punitiveness can legitimise and even increase this punitiveness and the public’s fear of crime and make it harder to satisfy public concerns. The anxieties of the public reflect what has been described as ‘ontological insecurity’, a free floating anxiety about social change, and this has now focused specifically on the scenes of looting and rioting. As the press has highlighted the burning and mayhem on the streets it has focused these general anxieties over law and order on the depravity of the nation’s youth. Moreover research on public opinion suggests that while the public may want stronger sentences for serious crimes, they are more willing to consider alternatives to custody for less serious offences. Furthermore, the public also has in interest in the cost-effectiveness of punishment and with the prison population at its highest recorded level, it is difficult to justify the enormous expense of custodial sentences for relatively minor offences. On 19th August 2011 the prison population was 86,654, compared to 85,523 on 5th August 2011, the week before the riots. Although current operational capacity is 88,093, two prisons are scheduled to close in the near future and pressure on places in mounting. The annual cost per prison place is almost 45,000 per year, a figure which does not take account of the ancillary costs of imprisonment, such as welfare payments if the breadwinner is absent, and the costs of the court proceedings leading up to the conviction, which would inflate the figure further. Furthermore it is likely that many of these sentences will be subject to appeal and may succeed. The first appeal to be heard, of Ursula Nevin, has resulted in a reduced sentence. But it would be better if a more reasoned approach could be taken at the sentencing stage. The prime minister’s concern to punish – and to be seen to punish – highlights the perennial tensions facing governments in showing the public that they are tough on law and order while seeking to cut the costs of the criminal justice system. But it is difficult to justify exemplary sentences on desert theory as they violate retributivist demands for proportionality, parity and equality, but it is also hard to defend them on utilitarian grounds as they do not satisfy the requirement for cost-effective punishment. 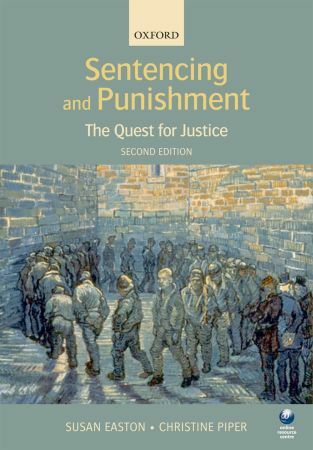 Susan Easton is co-author with Christine Piper of Sentencing and Punishment: the Quest for Justice, the author of Prisoners’ Rights: Principles and Practice, and Reader in Law at Brunel Law School. Christine Piper has also written this post for OUPblog.